Welcome back to MangoBot, a biweekly column about Asian futurism by TokyoMango blogger Lisa Katayama. Mad scientists. Beautiful women who specialize in amputations. Supercomputers that threaten to starve an entire hospital full of patients. Tumors that take on human form. Sounds like a freakish B-list horror movie, right? Actually, these are all seminal elements of a classic cult favorite manga by Tezuka Osamu. Black Jack is one of his darkest yet most appreciated works, but it hasn't had much exposure in the US market until now. This fall, Vertical Inc has started publishing this entire series, volume by volume, in English. 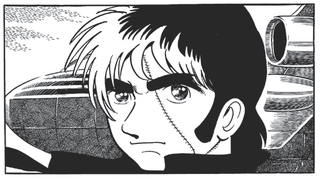 It's some of the best science fiction to ever come out of Japan.Black Jack is a mysterious, intelligent, unlicensed doctor who can cure anything, even if it's technically humanly impossible. His patients often have crazy demands-replacing a damaged body with a freshly murdered one, or getting an injection needle of a dying person's bloodstream. He'll work for anyone as long as they pay up, whether they're corrupt politicians or yakuza. But he's a good guy-and we know that because he only rips off rich selfish people, and he doesn't discriminate (his best friends are a killer whale and a teratoid cystoma). Black Jack's demeanor is slow and dark, yet he mysteriously arrives at places faster than an airplane could take him, and his hands are quicker than a sushi chef's. Black Jack was first serialized in a manga weekly back in 1973. Since then, it has inspired an anime, a TV series, and even traditional Japanese theater. The kyogen version of The Disowned Son, one of the episodes from the original manga, will debut at a Takarazuka theater in Hyogo prefecture on December 19. (Kyogen is a comedic form of traditional Japanese theater-similar to kabuki, but a lot less intense.) Black Jack Vol. 1 came out in September; Vol. 2 comes out mid-November, followed by Vol. 3 in January and the rest of the 17 volumes over the course of the next year or two. Don't miss it!